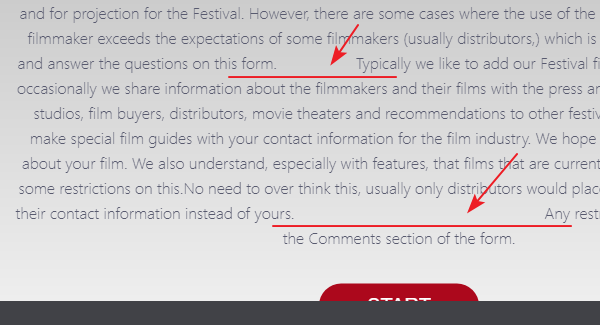 Some submitters do not see the START button on our RRFF Filmmaker Form. 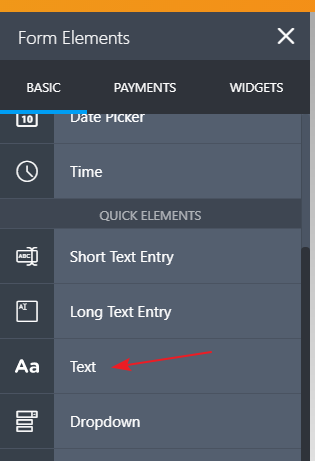 I have checked you JotForm http://www.jotform.us/form/73111971448154 and see that the welcome text is too long which is causing the Start button to pushed down. Also, I see that there is some unwanted spaces in the text which you may consider removing so that the Start button shall be pulled upward at least one line. Please give it a try and let us know if you need any further assistance. We will be happy to help. I need the text in there. It is for a contract. Where can I put the text??? The spaces are there because your form does not recognize a return. You may consider removing the text from the Welcome Page and add a Text field to the form in the beginning to display the same text. This would display the contract text on the second page of the form. Let us know if that helps.